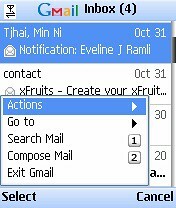 Fri 03/11/2006 09:50 Scr000051 Google just launched an application to access your gmail from your mobile phone. To install it, go to gmail.com/app and from your mobile phone. still waiting for more apps make it like yahoo go, sync all my info into my online account. I am trying to think of a reason why should I use new Gmail mobile. I have many accounts (Hotmail, Yahoo, AOL…) and with gmail mobile I can’t watch them over, I have to use another app for other then gmail. I use Movamail http://movamail.com/ that can open any account there is and I am satisfied with it. Eventually I will remove gmail and continue to use Movamail only for practical use.